There’s a significant debate now taking place in Washington – largely behind closed doors, but sometimes covered by the media – on whether fiscal conservatives should maintain a rigid no-tax-increase position. One side of the debate features Grover Norquist of Americans for Tax Reform, which is the organization that maintains the no-tax increase pledge. The other side features Senator Coburn of Oklahoma, who is part of a small group of GOP Senators who might be willing to increase the tax burden as part of a deal that supposedly reduces deficits. I’m a huge fan of Senator Coburn, who was in favor of cutting wasteful spending before it became fashionable. His office, for instance, releases a “Pork Report” every couple of days. But you shouldn’t read it if you have high blood pressure, because it will confirm (and reconfirm, and reconfirm, ad nauseum) your worst fears about tax dollars getting wasted. Nonetheless, I’m on Grover’s side on this tax debate for two reasons. First, we have a spending problem, not a revenue problem or a deficit/debt problem. Red ink is undesirable, to be sure, but it is a symptom of the underlying problem of a government that is too big and spending too much. But don’t believe me. 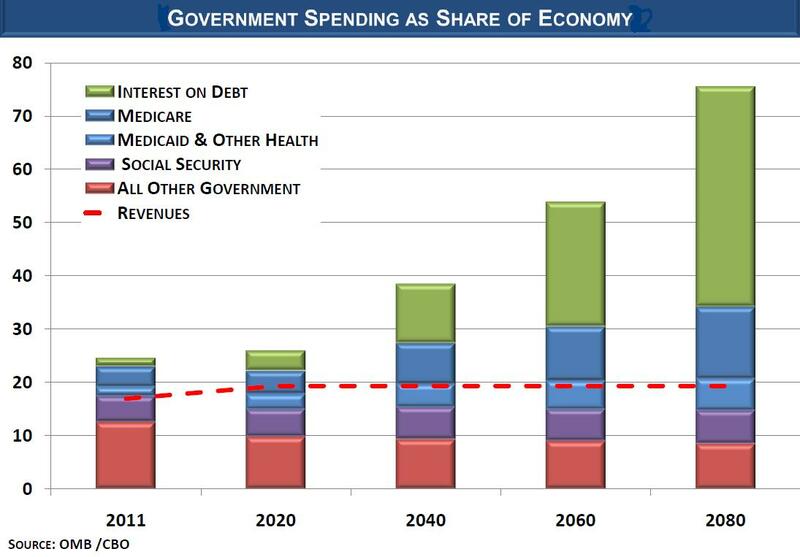 Here is a chart from the House Budget Committee showing long-run projections for spending and revenues over the next 70 years. As you can see, the long-run fiscal shortfall is completely caused by higher spending. In other words, 100 percent of red ink is due to government spending. So why put taxes on the table? 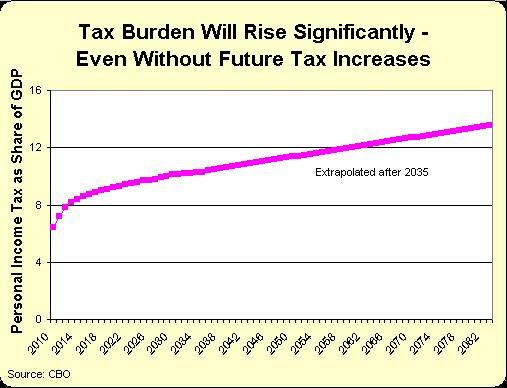 But this chart actually understates the case against tax increases. It uses revenue numbers from the Congressional Budget Office’s “alternative” forecast, which shows taxes steady at 19.3 percent of GDP. That’s more than the historical average of about 18 percent of GDP, which surely indicates that revenues are not the problem. I’ll actually be delighted if we can permanently keep federal revenues below 20 percent of GDP, but I’m not overly optimistic because the tax burden is projected to automatically increase over time. And I’m not talking about the expiration of the Bush tax cuts or the alternative minimum tax. Yes, those factors would push up tax revenues (at least based on static revenue estimates), but the tax burden also is expected to climb because even modest economic growth slowly but surely pushes more and more people into higher tax brackets. This second chart shows CBO’s estimate of personal income tax revenue based on current policy (as opposed to estimates based on current law, which includes already legislated tax hikes). To be more specific, it shows how much revenue the government will collect from the individual income tax even if the 2001 and 2003 tax cuts are made permanent and the AMT is indexed. As you can see, the aggregate individual income tax burden will increase by roughly 5 percentage points of GDP when compared to the long-run average of about 8 percent of GDP (the CBO estimate only goes to 2035, so I extrapolated to show the same time period as the first chart). And remember, this is the forecast of what will happen to income tax revenues even if politicians don’t impose any new laws to coercively extract more revenue. This might not be too bad if other taxes were falling, but that’s not what CBO is projecting. As such, this big increase in revenue from the individual income tax means that the overall tax burden will climb by approximately the same amount. In other words, revenue likely will rise close to 25 percent of GDP as we approach the next century. So if we use this more realistic baseline, we can say that more than 100 percent of the long-run deficit problem is because spending is out of control. o Tax increases rarely raise as much revenue as predicted by government forecasters. This is because of “Laffer Curve” effects, as taxpayers change their behavior to earn less income and/or report less income. Simply stated, people respond to incentives, and this means taxable income falls as tax rates increase. o Tax increases erode pressure to control spending. Why would politicians want to make tough decisions and upset special interest groups, after all, when there is going to be more revenue (or at least the expectation of more revenue)? Using more colloquial language, trying to control spending with higher taxes is like trying to cure alcoholics by giving them keys to a liquor store. o Milton Friedman was right when he said that, “In the long run government will spend whatever the tax system will raise, plus as much more as it can get away with.” In other words, if politicians think they can get away with deficits averaging, say, 5 percent of GDP in the long run, then the the only impact of higher taxes is an equal amount of additional spending – while still retaining deficits of 5 percent of GDP. The real-world evidence certainly points in this direction. We’ve seen “bipartisan budget summits” several times in Washington, and the result is more spending rather than lower deficits. Americans for Tax Reform has a good analysis of what happened after the two big budget summits in 1982 and 1990, but I think the problem is best captured by my adaptation of a famous Peanuts cartoon strip. 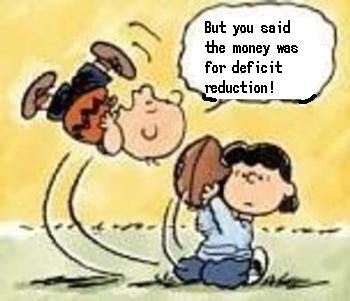 Every year, if my aging memory is correct, Lucy would ask Charlie Brown if he wanted to kick the football. At first, Charlie was skeptical. But Lucy always managed to trick him into giving it a try. And the inevitable result was Charlie Brown lying on his back wondering why he had been so foolish. In the Washington version of this cartoon, Democrats hypnotize gullible Republicans with ostensibly sincere promises of future spending restraint. Republicans eventually acquiesce, naively assuming that Democrats will be their new best-friends-forever in the fight against big government. Needless to say, that’s not the way the story ends. Like Ronald Reagan, Tom Coburn wants to do the right thing. But good intentions are not the same as good policy. America’s fiscal challenge is too much spending. Government is too big and it is wasting too much money. Taking more money from the American people is not the way to solve that problem. Next time I read a blog, Hopefully it does not fail me just as much as this one. I mean, Yes, it was my choice to read, but I truly thought you would have something useful to say. All I hear is a bunch of crying about something you could possibly fix if you weren’t too busy seeking attention. We don’t need to raise taxes or or come up with new players tofigure out what’s wrong with our government spending. WE ARE BROKE! so what happens when a business has no mre money? You look and see where you need to cut and stop the money from going out for example: Going out to countries that hate us. Going out to countries to help rebuild. Going out to useless research (do we really need to know about shrimp on tread mills?). We need to stop paying the people in government. after all WE ARE BROKE. We need to get back control of our government, they work for us, We pay their wages. Did you give them their out-rageous wages?? No they vote them in themselves. It’s time to stop this kind of wastful spending. Also, when you lose your job does tour ex-boss still pay you? NO. So why are we paying people who are no longer in government??? The 1982 tax increase mentioned in this article was actually, in terms of helping things it was supposed to help, the most effective tax increase ever. It came with simultaneous reductions in Social Security benefits, and by 1989, resulted in an actuarially balanced social insurance system. In fact, in 1989, Social Security had a large current cash flow surplus, and a long-term (75 years) actuarial surplus. This never happened again. While Ronald Reagan was humble, and properly took into account a possibility of being wrong about the 1982 deal, we should note that the official public debt increase during his Presidency was well balanced by dramatic improvement in the financial status of social insurance, so it may have been an error in terms of encouraging Congress to spend, but it was, at worst, a small error, matched with a lot of things done right. If only people who followed him made only errors like this. on June 13, 2011 at 8:11 pm BlueRidgeForum » High Noon For Ethanol Tomorrow in the U.S. Senate? on May 14, 2011 at 3:24 pm BlueRidgeForum » Does Appropriator Frank Wolf Seek A Taxing Bargain? That Charlie Brown picture is priceless, Dan. Well done!